It’s no secret that planning your wedding can be a stressful experience. Even the most organized bride can become overwhelmed by the work of planning a wedding. As you juggle the guest list, your last-minute fittings, and the myriad of details that you need to wrap up before the big day, you may experience symptoms of anxiety such as sleeplessness, fatigue, poor concentration, or excessive worry. However, there are ways to keep these feelings from spoiling the joy of marrying your best friend. 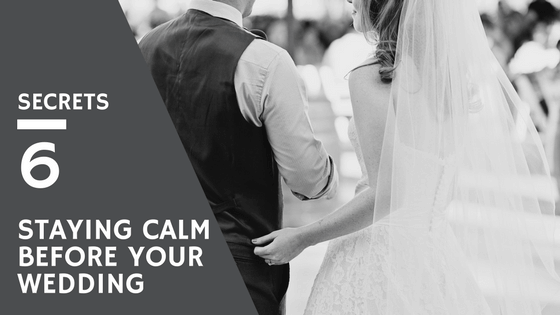 Here are six ways to stay calm in the hectic days before your wedding. Enjoy a day of stress-beating indulgences at the spa. A facial, manicure, or pedicure will help you relax while helping you to be your most beautiful on your big day. Many spas offer bridal packages that you can share with your bridesmaids. Make an appointment for the day before your wedding, and your skin and nails will be in top form for the special day. Yoga is a mind-body practice that combines physical positions, controlled breathing, and meditation or relaxation. Yoga is a proven way to help you relax and manage stress and anxiety. Breathing techniques mixed with yoga poses direct more oxygen to your body's vital organs. As a result, you will experience tension relief, sharper concentration, and less stress. 1. Lie on your back, with bent knees and feet placed flat on the floor about hip width apart. Slide your arms along the sides of your body with the palms facing down. Your fingertips should lightly touch your heels. 2. Pressing your feet into the floor and keeping your knees hip width apart, inhale and lift your hips as you slowly roll your spine off the floor. 3. Press into your arms and shoulders to lift your chest, using your legs and buttocks to lift your hips higher. 4. Hold this position for about six deep breaths. Then release on an exhale and slowly roll your spine back to a flat position on the floor. 1. From a standing position, exhale and bend forward, bending your knees enough to bring your palms flat to the floor and lightly press your head against your legs. 2. Feel the stretch in your spine as you gently pull your head down and then in towards your legs. Press your hips up and straighten your legs to intensify the stretch. 3. Hold this position for about six deep breaths. Then bend your knees and inhale as you raise your arms and torso back up to the standing position. The more time you spend focusing on your breathing and on your mind-body connection, the stronger you will feel. Remember when your friends and family members offered to help you with the wedding when you told them about your engagement? With the wedding fast approaching, it’s time to take them up on their generous offers. You cannot do everything on your own. Enlist help for running last minute errands and making phone calls. Here are a few other tasks to assign to trusted individuals. If there ever was a day to want to look and feel your absolute best, it is your wedding day. After searching the internet and the wedding magazines for possible hairstyles, it is time to visit a trusted hair salon for professional advice and assistance. Most brides begin a diet and fitness regime long before their wedding day. It’s great to want to look and feel your best, but eating a very low-calorie diet can add to the stress of wedding planning. What are your favorite treats? Ice cream? Chocolate? Mom’s homemade lasagna? Plan to indulge in one of your favorites before the wedding. Food is one of the comforts of life, and you will enjoy the way a little letting go helps you unwind and relax during this stressful period. Reading is a great escape. When you find that you cannot turn off your mind from all the wedding tasks, grab a good novel and leave the rest of the world behind for a little while. Getting lost in a book can lower your heart rate and ease the tension in your muscles. A University of Sussex research study found that reading can reduce stress by nearly 70 percent, and it works faster and better than other known stress-reducers such as listening to music or drinking a hot cup of tea. Think about why you’re doing all of this work. Think about the love you and your fiancé share and about the wonderful life you will build together. When you consider all the wedding details as simply a means to a glorious end – the two of you together – that makes it all worthwhile. Today's tips were brought to you by Grand Salon, a full-service beauty salon based in Denver. We pride ourselves on outstanding customer service, and offering the most fabulous cuts, color and style services in Denver. Come explore our skin care services today!